What Does God Think About Fund Raising? 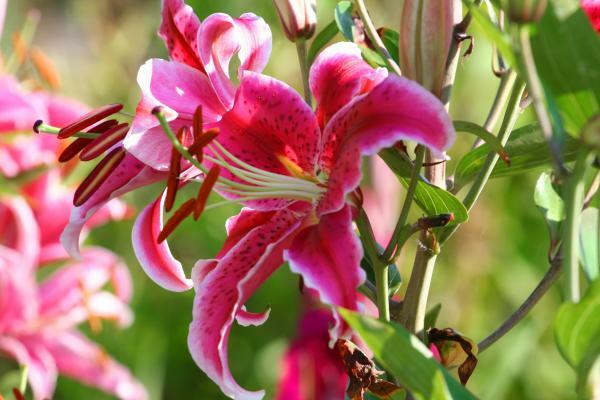 Consider the lilies of the field! Just one month ago, Let’s Start Talking began our annual general fundraising drive. We had approximately five weeks left in our fiscal year and were $135,000 short of our 2010 budget projections for fund raising—a very serious amount for LST. We had a multi-pronged approach for reaching our fundraising goals: We all committed to prayerfully ask God; Sherrylee committed to calling all general donors (not worker donors) from the last two years; the staff committed to calling all our former LST workers who had been out of college at least five years, and we would ask the guests attending our Harvest Call Benefit Dinner on September 25th in Fort Worth to give. Our need/goal was much greater than we had every even dreamed of attempting before. By God’s grace and mercy, I’m happy to say that we received enough donations to cover the entire ministry shortfall! I’d like to share with you, not how-to’s, but lessons remembered and learned in this month of intense fund raising! God is rich! He has all the money in the world. If we look at money has something that belongs to us, then we should worry about the hard economic times many of our supporters are facing! If we understand that God is the Creator and Donor of everything we receive, then we and the people we ask for funds are just caretakers/managers/temporary users of His things! And He is not short of funds! God is grace-full! The core idea in the word grace is that of a gift! When we ask people for gifts, we are asking for grace. If they give us a gift, they extend grace to us. If God is the First Donor of every good gift (James 1:17), then His generosity is the same as His graciousness—and He is rich in grace (Ephesians 2:7), full of grace (John 1:14), there is no end to His generosity! “We have confidence before God and receive from him anything we ask, because we obey his commands and do what pleases him”. 1 John 3:21-22. Maybe our problem is that we have gotten into the habit of asking for ourselves. A Choice Between Fear and Confidence! The economy is poor, everyone’s budget is tight, our home church just launched a huge capital campaign, the economic future is unpredictable—these are all good reasons to fear asking Christians for special gifts to meet big goals. God is rich, God is generous, and God is good—these are all better reasons for not being afraid to ask Christians for special gifts to meet big goals. The last month of asking for LST and the astounding goodness of God in fulfilling all of His generous promises has confirmed for me again that fear is a sin, not a choice. Thank you for taking the time to reflect on your recent FR experience. God is good – and seeking partnership and help is a humbling and invigorating way to discover that. I appreciate your encouragement. God always provides when we ask with the right motives.